Q: How did writing a book that you knew would be read so closely by so many compare to writing your first book, when few people knew who you were? A: In many ways, Dreams from My Father was harder to write. At that point, I wasn't even sure that I could write a book. And writing the first book really was a process of self-discovery, since it touched on my family and my childhood in a much more intimate way. 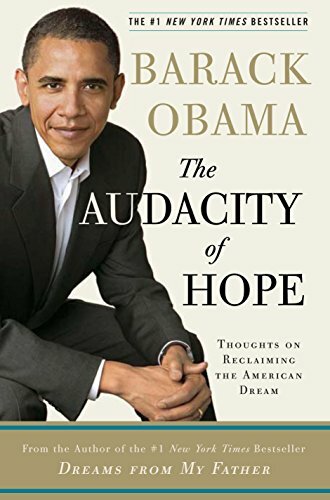 On the other hand, writing The Audacity of Hope paralleled the work that I do every day--trying to give shape to all the issues that we face as a country, and providing my own personal stamp on them. Q: What is your writing process like? You have such a busy schedule, how did you find time to write? A: I'm a night owl, so I usually wrote at night after my Senate day was over, and after my family was asleep--from 9:30 p.m. or so until 1 a.m. I would work off an outline--certain themes or stories that I wanted to tell--and get them down in longhand on a yellow pad. Then I'd edit while typing in what I'd written. Q: If readers are to come away from The Audacity of Hope with one action item (a New Year's Resolution for 2007, perhaps? ), what should it be? A: Get involved in an issue that you're passionate about. It almost doesn’t matter what it is--improving the school system, developing strategies to wean ourselves off foreign oil, expanding health care for kids. We give too much of our power away, to the professional politicians, to the lobbyists, to cynicism. And our democracy suffers as a result. Q: You're known for being able to work with people across ideological lines. Is that possible in today's polarized Washington? A: It is possible. There are a lot of well-meaning people in both political parties. Unfortunately, the political culture tends to emphasize conflict, the media emphasizes conflict, and the structure of our campaigns rewards the negative. I write about these obstacles in chapter 4 of my book, "Politics." When you focus on solving problems instead of scoring political points, and emphasize common sense over ideology, you'd be surprised what can be accomplished. It also helps if you're willing to give other people credit--something politicians have a hard time doing sometimes. Q: How do you make people passionate about moderate and complex ideas? A: I think the country recognizes that the challenges we face aren't amenable to sound-bite solutions. People are looking for serious solutions to complex problems. I don't think we need more moderation per se--I think we should be bolder in promoting universal health care, or dealing with global warming. We just need to understand that actually solving these problems won't be easy, and that whatever solutions we come up with will require consensus among groups with divergent interests. That means everybody has to listen, and everybody has to give a little. That's not easy to do. Q: What has surprised you most about the way Washington works? A: How little serious debate and deliberation takes place on the floor of the House or the Senate. Q: You talk about how we have a personal responsibility to educate our children. What small thing can the average parent (or person) do to help improve the educational system in America? What small thing can make a big impact? A: Nothing has a bigger impact than reading to children early in life. Obviously we all have a personal obligation to turn off the TV and read to our own children; but beyond that, participating in a literacy program, working with parents who themselves may have difficulty reading, helping their children with their literacy skills, can make a huge difference in a child's life. Q: Do you ever find time to read? What kinds of books do you try to make time for? What is on your nightstand now? A: Unfortunately, I had very little time to read while I was writing. I'm trying to make up for lost time now. My tastes are pretty eclectic. I just finished Marilynne Robinson’s Gilead, a wonderful book. The language just shimmers. I've started Team of Rivals by Doris Kearns Goodwin, which is a great study of Lincoln as a political strategist. I read just about anything by Toni Morrison, E.L. Doctorow, or Philip Roth. And I've got a soft spot for John le Carre. Q: What inspires you? How do you stay motivated? A: I'm inspired by the people I meet in my travels--hearing their stories, seeing the hardships they overcome, their fundamental optimism and decency. I'm inspired by the love people have for their children. And I'm inspired by my own children, how full they make my heart. They make me want to work to make the world a little bit better. And they make me want to be a better man.